Attractive Business Model for Customer Innovation: Peers Inc. In September 2012, at the Business Innovation Factory annual confab, BIF-8, I had the opportunity to hear Robin Chase tell her story. She talked a little about what she learned from co-founding Zipcar, and a lot about how she wanted to push the envelope with her newest company, Buzzcar. Robin conveys infectious enthusiasm, not just about car-sharing and environmental sustainability and making our cities livable communities. She’s also enthusiastic about a “new” business model which she has studied and adopted. She calls it “Peers Inc.” I really like the way that Robin has “unpacked” a business model that has become very popular in the past decade. Her main point is this: if you want to grow a sustainable business really fast, you should COMBINE a peer-to-peer network with a company. The company does what companies do best: It provides economies of scale, it invests in long-term assets and intellectual property, it mitigates risk, it provides recourse, and it wraps that all in a brand promise. However the company doesn’t provide the products. The products and services are provided by the customers. That means they can be highly customized, specialized, localized, and diverse. Customers use their own social networks to promote their wares and to attract other buyers and sellers. As you may be aware, the Boston Globe, our local paper, is in danger of being shut down--at least the print edition! This has caused one of my readers--David Lance--great angst and some great creativity.. In fact, in his ruminations (below), he came up with some market research suggestions for the Globe and their Union, a Vision of what a useful newspaper should be, and a business plan!!! While I like reading news on the Web, it is sporadic and more a distraction than focused information gathering, or relaxed entertainment – such as I get from reading newsprint. I dislike the clutter of www.boston.com. I love the feeling I get when reading something really compelling from physical newsprint paper while eating a bagel. Perhaps that is reason enough to preserve the media. Perhaps not. Somebody from the newspaper industry might study a person thus focused on a Sunday morning, and create some giveaway accessories they could use to entice some of us back above the fold. Maybe some little gizmo that reliably keeps the orange juice off the bed sheets - for example. I want reporters to uncover what I want to read about. I would pay for that. It would be really nice (not to mention extremely savvy), if somebody from the New York Times or the local unions would maybe talk to me before conceding they can not entice me to trade a hundred pennies for a copy of their newspaper every day. In 1994, Craig was working at Charles Schwab evangelizing the Internet. It's an information-intensive business. He began to comment on arts and cultural events. His buddy Jim Buckmaster is the Webmaster. "We pretty much do one thing well. We prefer not to screw it up. I pretty much do full time customer service. I still do. " My previous life was in politics and social science. We worked on on the internet--helping political organizations do grass roots outreach. There were limited ways to mobilize the passion. A couple of years ago, Web 2.0 tools made it easy to mobilize -- A community at the March of Dimes for parents with children who are in neonatal intensive care. Alex: You have to connect with people who are passionate about your brands. The approach we use is "Reflective Glory Marketing".. create a community of something that people do feel passionate about. Example: You can Change Everything if you change your bank..Vancity credit ... let's you list all the things you'd like to change in your community... you can't sign up for a credit card there. You can declare what you care about in the community. Craig: We are a community service to a degree. If you focus on being a community service, you tap into that human social need to connect and to help. Newspapers used to perceive itself as community services, which is important in a country that is trying to be democracies. But in recent years, they've focused on profit margins; they've fired investigative journalists. That's a mistake. There are now folks who are helping journalists get paid for doing investigative journalism. For example, what lobbyists are paying what congressmen for what legislation. It all comes down to community service and trust. It's an interesting observation that the most trusted name in journalism in Stephen Colbert and John Stewart. Alex: Right, Colbert really gets 2.0.He lets his fans build and maintain the Colbert Nation web site and he just plays with them on it. Scott: I Told the Boston Globe--guys here's the fundamental problem with traditional publishers, I just rented my vacation cottage on Craig's List. You need to decide what you're trying to achieve. If you're a news organization, you have to decide what you're trying to achieve. The NYTimes doesn't want citizen journalism. Lots of people talk about OhMyNews in South Korea. They have 12 or 15 editors, all the content is sent in from folks out in the field. Craig: Companies should engage their communities to provide better customer service and to improve products. If you have customer company reps on discussion boards where they're helping customers solve problems and have company people visibly listening, to actually change the products and services. Provide discussion boards, engage your community thru them, take some chances. If someone says the wrong thing, it may haunt you, but it's worth the risk. We should also have internal discussion boards. The people on the front lines know a lot more about what's going on... Everyone tells their boss what they want to hear. Internal discussion boards offer the possibility of breaking the internal communication failure. Scott: About is actually a pretty small organization... 600 people. A lot of our content is generated by contractors. They have their own internal discussion site to share what's going on. It's incredibly valuable. Talk about Control: We did things with NBC for the Olympics.. it's all about the Control of the Olympic Committee. We had a blog that allowed people to sound off about what wasn't working in the NBC coverage of the Olylmpics, which they wanted so they could get out from under that control. Ben McConnell provided the second keynote.. His blog is Church of the Customer. I came back late from the break, so I missed some of his opening remarks, in which he was talking about MTV's "catch-up" attempt to get their customers to remix video and music. 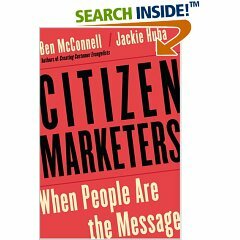 Then he went on to talk about the number of people who are involved in "Citizen Marketing." Traditional media companies are being disrupted. But so are companies in every industry. It's so easy to become a content creator. What we have here are the roots of amateur culture taking shape. They're free to create whatever they want. They've grown up having their lives documented for them by their parents. So it's natural for them to document their own lives and share them with their friends. This is why YouTube has become the fourth media channel. Tila Tequila--most connected person on MySpace... 1.7 million friends. A young woman with a foul mouth. Released a song. Started a music career. Released it directly to iTunes, bypassing traditional record companies. She has the ability to create this stuff. And the ability to connect to a huge set of folks. We're now social media. Include the community into the media and inviting them to engage. More than 55% of kids 12 to 17 are involved in social networks. This is being fueled by access to broadband. By the end of Sept. 2006, there were 139 million households with broadband access.. X 4 per household. Soon, we'll have 600 Milion people online around the world who have broadband access and will be creating STUFF. Freedom of speech and freedom of assembly -- traditional values. We need to give people a voice, a vote and a vocation. This is influencing politics in a very big way.. in the very first week.. 70,000 members on Mybarackobama.com. 2400 separate groups, hundreds of fundraising pages--all of this in one week.